In 2016 Gigawatt entered into a Joint Venture with investor Ilan Goldstein to create an associate wind company, Gigawatt Global Wind, to capitalize on Gigawatt’s success and contacts and to add additional value to both our shareholders and to the energy offerings of developing countries. Gigawatt Global Wind is governed by the co-founders, Ilan Goldstein [link to bio on featured investors page] and Josef Abrawowitz [link to bio on team page] and is managed by Gigawatt’s corporate management team and project developers. Gigawatt Global Wind’s project selection strategy is similar to the strategy used by Gigawatt Global for solar PV. The geographical focus for wind projects is Sub-Sahara Africa. The wind potential is huge and largely untapped. The most valuable regions for wind are (1) the countries along the great African rift, (2) Southern African countries and (3) the Atlantic coast. Gigawatt Global Wind’s initial approach is to develop medium-size wind farms (10 to 25 MW), with short development time-frames to showcase a successful commercial project. Some countries have conducted wind resource mapping campaigns. This data is very helpful in finding optimal sites for our projects, and assists the developer to shorten the development period, since less time is required for on-site measurements to reach bankability. The energy content in the wind (‘wind density’) varies with the average wind speed squared; a slight change in the average wind speed on a given site has a significant impact on the productivity and revenue projection of the potential site. 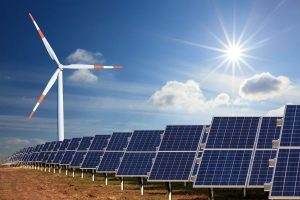 Markets where Gigawatt Global is currently actively developing solar, where the co-development of wind and solar projects constitutes a valuable asset. Markets where adverse policies or regulations are restricting the development of solar but where Gigawatt Global already has contacts and wind projects can be pursued. Low-competition markets with large energy deficits, which have expressed interest in IPP-led Renewable Energy project development, with a special focus on PowerAfrica target countries, and on countries which are the beneficiaries of energy programs funded with multilateral aid money.